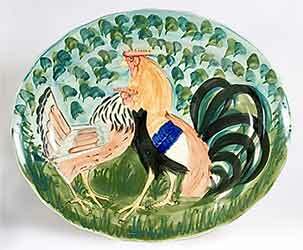 Oxney Green rooster platter - 17⅞" (454 mm) long, 15" (381 mm) wide. Iden Pottery is best known for its stoneware, and the quality has always been excellent. It was set up by Dennis Townsend at his home in Iden, a village near Rye, when he left the Rye Pottery in 1959. Due to lack of space in his garden shed workshop he moved to larger premises in 1962, and then again in 1966 to Rye, taking over the premises of Ray Everett in Conduit Hill, where he operated until its closure. By 1968 there was a large export side to the business, and at home the wares were stocked by Heals and Harrods. In 1972 Jim Elliot bought in as a partner (Jim was later to take over Cinque Ports) and stayed until 1980. Over the years the company expanded and contracted to suit the economic climate, and managed at best to be very successful and at worst to keep its head above water. In the early 1990s Iden were involved in a commercial venture that enabled them to supply goods for export in much larger quantities than could be handled by the pottery in Rye. Dennis's son, David, established the Oxney Green company to handle the large-scale manufacture of goods in Stoke-on-Trent. Patterns were made and hand-painted in Rye and sent to Stoke where they were mass-produced and printed with an eight-colour process that was difficult to distinguish from the hand-painted originals. The largest number of Oxney Green products went to Martha's Vineyard in the USA, but there were three other importers in America and some in Japan. Iden pots can sometimes be dated by closely looking at the blue oxide backstamp. In 1974 a small notch was cut in the outer circle, and another each following year. Count the notches, if you can see them, and add them to 1974.